Thank you times one million (well, times approximately 3,153) to all our new and upgrading ONRAC listeners, not to mention the champions who have sustained us for years! We offer an update on our successful drive, a recap of how our eventful April Fools episode came to be, a check-in on our recent faith healing results, and more. Plus, Ella Poppy eats some kibble. Tagged with MaxFunDrive, MaxFunDrive2019, April Fools, Portal, faith healing flat earth. April 3, 2019 by Oh No Ross and Carrie. SURPRISE! You are the most amazing fans in the whole frickin' world, and you blew right past our initial goal of 2,000 new and upgrading members. So, with four days left in MaxFunDrive, we are announcing four outstanding stretch goals. Enjoy this little 7-minute episodelette, in which we announce rewards if we reach 3000, 3500, 4000, or even 5000 new and upgrading ONRAC members. Plus, a bizarre promise from Carrie if a million people sign up. 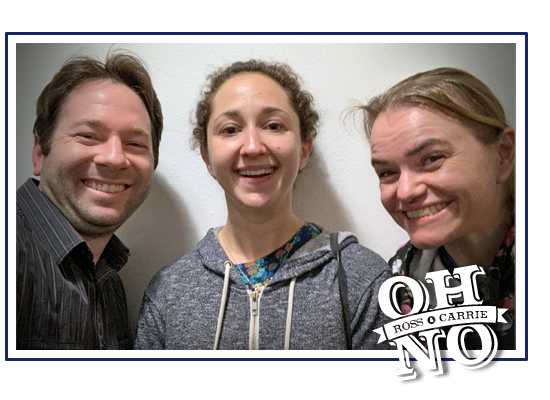 Head on over maximumfun.org/donate to find out what AMAZING gifts you can get if you sign up by the end of the month, including a gorgeous "Oh No, Ross and Carrie" enamel pin! Tagged with MaxFunDrive, fundraising, Braco, Scientology, tattoos, Bill Clinton. March 27, 2017 by Oh No Ross and Carrie.